What is Fortumo Android SDK? Fortumo Android SDK is a payment integration for processing payments for advanced and premium features. It lets developers offer their users a convenient way to pay for the additional tools they want to use without getting redirected to their device’s browser or to another app. On top of that, they can process offline payments, too. With Fortumo Android SDK, app developers and similar merchants can collect payments from customers in over 100 countries. All they have to do is integrate the solution with their app using the solution for Android device-only processing. Furthermore, Fortumo Android SDK works with more than 350 mobile carriers around the world. This lets developers make the check-out experience more seamless and more secure for their customers. Integrating Fortumo Android SDK into mobile apps let developers reach a wider network of audience. That is because the solution can process payments in over 100 countries and with a coverage of more than 350 mobile operators across the globe. This way, companies only need one SDK to process payments in different areas. Fortumo Android SDK is a true solution for in-app payment processing in Android devices. One integration can work on any Android-powered smartphone and tablet so developers can make it easier for their users to pay for premium features and services. The Fortumo Android SDK can be utilized in all kinds of Android app stores. These include the carrier and device manufacturer online shops. This ubiquity gives users the flexibility of choice as to where they want to access the app. Most payments occur when the consumer is online. But what if they want to access something behind the paywall when there is no internet connection in the area? Developers can seamlessly surmount this challenge by employing the Fortumo Android SDK into their mobile applications. This allows them to offer beyond-standard features to their audiences even when they are off the internet grid. Some customers may want to use a tool or a service for a single or a limited time only. With Fortumo Android SDK, developers can give users the chance to experience what is behind the paywall for the length of time they desire, no matter how short it is. Plus, this also works for apps that only require one payment for a forever access to premium features. Taxation is a challenging topic in any country in the world. But with Fortumo, developers can rest assured that their taxes are duly paid and everything that gets funneled to their bank is theirs, with no additional cuts. Checkouts using credit or debit cards can be an arduous process. But with Fortumo Android SDK, users get to experience a smoother and simpler checkout so they can enjoy those premium services faster. Fortumo arms developers with in-depth data that lets them gain a deeper understanding of in-app transactions. This allows them to see information on different metrics such as which country spends the most on their upgraded services. With this, they can enhance their marketing strategy to attract more markets. It can be an encumbrance for customers to have to enter their payment details month-to-month for premium access. If that continues, they might cancel their subscription for good. No developer wants that to happen, which is why the Fortumo Android SDK supports recurring payments. This allows them to offer a periodic option to consumers to make it more convenient for them. If you are considering Fortumo Android SDK it may also be sensible to investigate other subcategories of Best Mobile Payment Systems collected in our base of B2B software reviews. There are trendy and widely used systems in each software group. But are they essentially the best fit for your enterprise’s special requirements? A trendy software product may have thousands of users, but does it present what you need? For this reason, do not blindly shell out for popular systems. Read at least a few Fortumo Android SDK reviews and consider the factors that you want in the software such as the cost, main tools, available integrations etc. Then, shortlist a few apps that fit your wants. Check out the free trials of these products, read online opinions, get explanations from the vendor, and do your homework thoroughly. This exhaustive research is sure to help you select the most excellent software platform for your company’s unique needs. How Much Does Fortumo Android SDK Cost? The free version of the solution is only for merchants that process less than $100,000 in payments per month. Merchants that process payments from $100,000.00 and above can request a custom enterprise pricing. We realize that when you make a decision to buy Mobile Payment Systems it’s important not only to see how experts evaluate it in their reviews, but also to find out if the real people and companies that buy it are actually satisfied with the product. That’s why we’ve created our behavior-based Customer Satisfaction Algorithm™ that gathers customer reviews, comments and Fortumo Android SDK reviews across a wide range of social media sites. The data is then presented in an easy to digest form showing how many people had positive and negative experience with Fortumo Android SDK. With that information at hand you should be equipped to make an informed buying decision that you won’t regret. 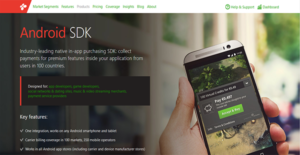 What are Fortumo Android SDK pricing details? What integrations are available for Fortumo Android SDK? Fortumo Android SDK can integrate with any application developed for Android devices. Additionally, Fortumo has a Reporting API that lets developers connect with business intelligence applications for drilled-down analyses. If you need more information about Fortumo Android SDK or you simply have a question let us know what you need and we’ll forward your request directly to the vendor.